Look, I started this post on Wednesday, really, I did. It’s just that typing with one hand while jiggling a baby with the other… well, it’s kind of a slow endeavor. Glacially slow, actually, when you consider that I was supposed to post this last Wednesday. Oy. Let’s just get on with it then, okay? I started with the easy ones: into the garbage went all of the shoes with holes through their soles, cracked and peeling leather uppers, and other things that would render them almost useless to even the most desperate hobo. Surprisingly there were about six pairs (between Mr. December and me) that fell into this category. 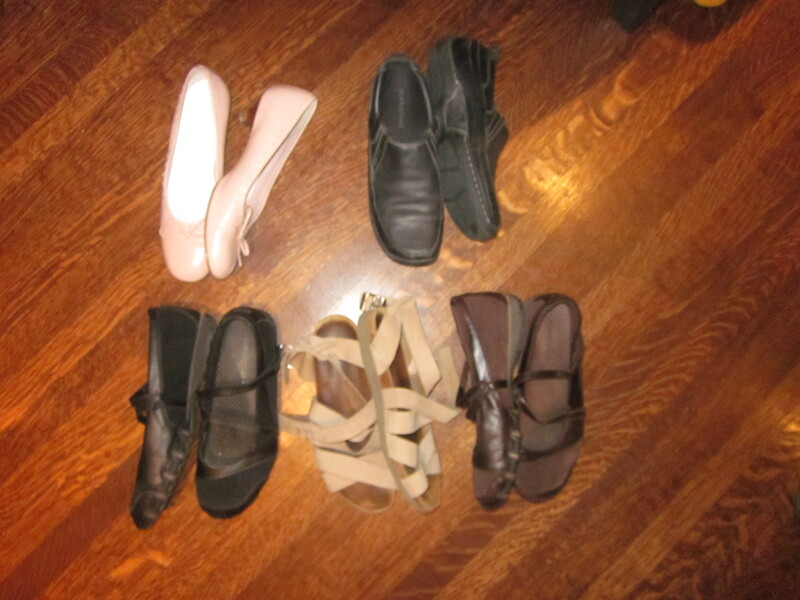 So seriously, if you live in the Greater Toronto Area and want any of these shoes, please let me know. Any unwanted or unclaimed shoes will go into the goodwill box on December 1. Now that the shoes have been culled, the front hall bench/shoe rack looks much better. Once again, this was a matter of sorting through things and finding their places. For all that I’ve been dreading the task, it didn’t take very long. Bottom line: I can now see the bottom of my sink. I could probably even use it to soak things in! K’s birthday is at the end of December, and this year will be the first time I’ve planned a birthday party more than a day in advance. I’m sending an evite to the parents, but I remember how awesome it was to get mail as a child, so the kids will get paper invitations. K has about 16 kids on her list (which I think would be too many if they all came, but they won’t), so I need to make 16 invitations. I’ll post a pic here next week. People gave us gifts when R was born, and it would be rude not to thank them. This time I’ve smartened up: I’m sending thank-you emails. This seems to be the only way to ensure that they all actually get sent and don’t just end up sitting in the bottom of an out-of-season purse for the next three years… not that I would know from personal experience… ahem. As I was saying, I’m mostly sending emails, with a few handwritten thank-you’s for elderly relatives and distant family friends whose emails I don’t have and can’t easily get. My goal for this week is to thank everyone for their gifts one way or another. So that’s it… please tell me what you have planned. I miss getting comments! What I have planned? Surviving. That’s about it. As I just wrote on my own blog, this year has not been kind to us at all. I’ve been tried and tested more times this year than I care to contemplate. So surviving is the order of the day. Other than that, I’m prepping for Christmas in our house. Shopping. The tree. Decorating the house with lights outdoors. Christmas cards. Baking pans of scrumptious cookies to give away. Figuring out Christmas dinner. All the insanity that goes along with the holiday. But I like it. I gotta say, I think one hour of productive time per three days is GREAT when you have three little ones! Seriously. No one can ask anything more than that! Besides, you’re such a resourceful lady, and so skilled at crafts, homemaking and all sorts of good things, I think you’re doing a bang up job! Kudos! My hat’s definitely off to you. That’s all from me. I just wanted to say hi, comment (cause you’re missing them, and I’m slacking in commenting!) and hope that everything is going well in your neck of the woods. Hugs from “up the road” in Ottawa!